Tank Raider is a retro tank arcade game by Sunday Solutions that puts you at the controls of an arcade tank pitted against three crafty computer-controlled tanks. Your mission is to capture and hold more gems than the other tanks. Controlling your tank is a snap — trace out a path through the terrain from your base, and your tank will follow. Tap on objects or enemy tanks to automatically target and fire upon them. A mini-map shows the locations of available gems and enemy tanks. Return gems you’ve collected to your base or destroy enemy tanks to capture theirs, but stay vigilant because enemy tanks will attempt to steal your gems. If you take damage, you can get repairs at your base. Gameplay is smooth, and the landscapes are nicely detailed. The AI tanks provide a good challenge so you’ll have to play smartly. Power-up stars boost your bullets, increase your speed, or replenish health. They'll come in handy as you try to master all three levels. Unfortunately, there is no multiplayer option so once you complete the game, there is little replay value. 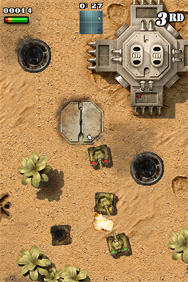 Tank Raider is a fun arcade tank game requiring quick decision-making and careful planning. The touch interface is well executed and makes for a challenging experience and good value. It's a bit thin on content, however, and leaves you wishing for more levels, more varied weaponry and more opponents. Tank Raider is compatible with any iPhone or iPod touch running iPhone 2.2.1 or later.